In Week #46's inspiration I shared how a few of my friends and I were having a cookie baking party. Of course, there needs to be a little pre-party fun with a mail project. Once again, I decided to test the skills of USPS and mail a odd object just to see if it would travel well and it did. 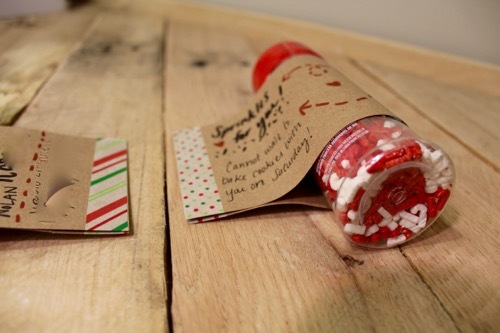 I mailed Christmas themed sprinkles to the kiddos joining us for the baking party. I simply added a wrap around, flag-style label, washi tape, some doodles and $3 worth of stamps. The actual price for their desination was $2.94 each, so be sure to have your local office calculate correct postage. As a general rule, anything less than 13 ounces can be mailed as-is (no box, envelope, etc). Who are you going to mail sprinkles to? Want to see more odd shaped mail? Check out this, this and this.